The Hotel Gallia is located about a 10 minute stroll away from the famous Djemaa el Fna square. It's a somewhat small hotel (there are less than 25 rooms all together) that was built in 1929 and has retained all of the charm of the period. Since the hotel is listed in almost every guide book on Marrakech, it's essential to make reservations. It is extremely popular for being one of the most affordable and nicest hotels in the medina. The courtyard is in the center of the building a provides a cool and relaxing place to sit. There are succulent plants that trail from the upper floors onto the courtyard and palm trees throughout. The sound of singing birds add to the enchantment of this pleasant French Colonial setting. 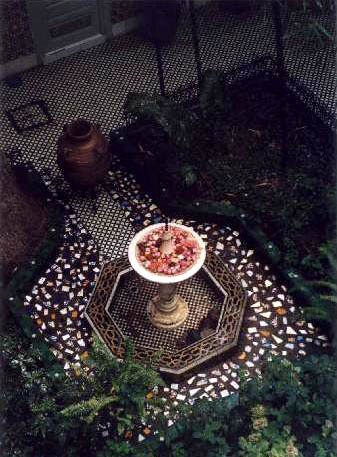 Multi-colored tiles are decorated around the courtyard area where breakfast is often served.